Moonflower Yoga studio in Bellmore, Long Island, New York, Nassau County. Reiki training. Reiki Healing Circles. 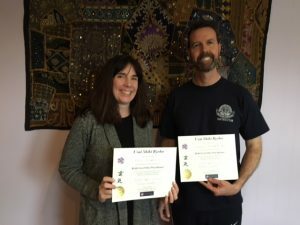 Reiki Level One, Reiki Level Two, Reiki Level 3 Master Training. | Moonflower Yoga Inc.
Reiki, founded by Mikao Usui, is a Japanese technique for relaxation and stress reduction. It is pronounced “Ray” “Key”. Reiki is being used by leading medical institutions, including major cancer treatment centers, as an alternative therapy. Reiki works with universal life force energy – the energy in and around all living things. When this energy is blocked, it causes an imbalance often leading to discomfort or disease. When the energy is flowing more smoothly, we often feel better. Reiki allows loving, healing energy to flow through you. Reiki is NOT a religion. No specific religious beliefs are necessary. Reiki is spiritual and allows you to have a deeper connection to yourself. Reiki is open to all who would like to explore this beautiful, healing energy. Reiki can reduce your stress levels. Stress is a leading contributor to many diseases including heart disease and high blood pressure. Reducing your stress improves your health. Reiki may help relieve muscle tension by releasing blocked energy. Reiki can provide better sleep at night, and it is important to have adequate sleep to allow your body and mind to function properly. There are no dangerous side effects to having a Reiki treatment. Reiki can be used to help infants as well as seniors. Reiki can be used on pets. Dogs and cats love Reiki treatments! Reiki can complement other treatments you receive. Leading cancer institutions offer Reiki as an alternative therapy in addition to radiation and chemotherapy. Reiki is easy to learn and can be used on yourself as well as others. 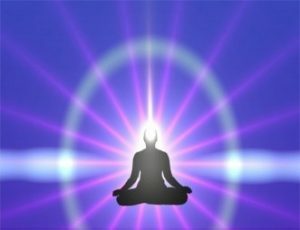 Reiki works by having universal life force energy flow from the person providing the treatment to the person receiving the treatment. It is done by having the Reiki practitioner gently hovering their hands on the person receiving the treatment. The person receiving the treatment can be seated in a chair or reclining. Unlike other treatments, because universal life force energy is flowing, both the person receiving the treatment and the person providing the treatment receive relaxing Reiki energy during a treatment, and the practitioner’s energy is not depleted. 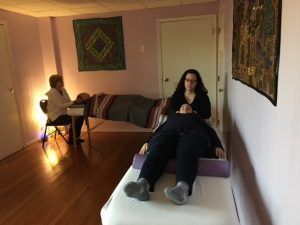 A session usually begins at the top of the head (where stress is often accumulated) and from there the Reiki practitioner can lay their hands gently (as needed) on the shoulders, arms, heart, abdomen, knees, and feet. You would also use similar Reiki techniques to provide a relaxing Reiki treatment to yourself. 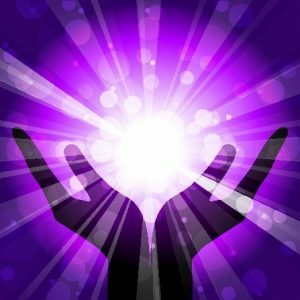 Reiki Level One where you learn basic Reiki healing treatments for yourself and are shown techniques for helping others. You receive the first 4 attunements. Reiki Level Two where you further learn how to work on others and are introduced to Reiki symbols which enhance your Reiki treatment. You receive 2 additional attunements. Reiki Level Three (Master Practitioner) in which the last 3 Reiki symbols are learned and where you receive the final 4 Reiki attunements. Moonflower Yoga offers Reiki training on all 3 levels of Reiki. Each training session also includes an extensive 30-40 page training manual with illustrations so that you can practice Reiki at home. See below for our next available Reiki training session or Reiki Healing Circle. A Reiki Healing Circle is a wonderful way to be introduced to Reiki. 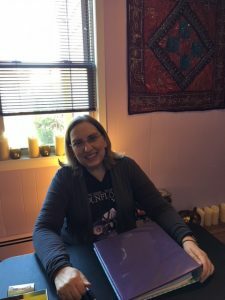 NO prior Reiki experience is necessary, and it is open to all! In a Reiki Healing Circle, one person in the center of the circle receives a Reiki treatment from the others around the circle. The person in the center is usually reclining. The other participants will gently hover their hands on the recipient on either the top of the head, shoulders, abdomen, knees, or feet. For those with Reiki experience, they can apply what they have learned in their Reiki training sessions to help the person receive a lovely treatment. For those with no Reiki experience, we will show you how to do some basic positions. Each person has an opportunity to move to the center of the circle and receive a relaxing Reiki treatment. At Moonflower Yoga you receive personal attention in a loving, caring environment. This is especially true during a Reiki training session. 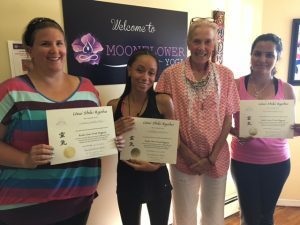 Moonflower Yoga owner, Nancy Weshkoff, who is a Reiki Master Teacher, keeps the training session sizes very, very small so that you can receive a lot of one-on-one personal attention during the training. When you are learning how to do a Reiki treatment, she is alongside you helping you with the hand positions needed. Nancy also provides you with a very informative and illustrated, 30-40 page handbook for each level which gives you step-by-step instructions on working with Reiki energy. You will see additional information below on the upcoming Reiki activities at Moonflower Yoga including our next Reiki training sessions. If you have any further questions, you can contact Moonflower Yoga owner and Reiki Master Teacher, Nancy Weshkoff, at the studio number: 516 557 2206. Reiki is a wonderful system to promote relaxation and has been used for many years. With Reiki, you are working with universal life force energy. It is now being offered as an alternative therapy in leading medical institutions. Reiki is done by gently hovering your hands on the person receiving the treatment. For those who are Reiki trained, you will use your Reiki knowledge to provide a treatment to the person in the center of the circle. For those who are not Reiki trained, you are welcome to come, and we will show you the simple steps you can do. Each person will have an opportunity to receive a Reiki treatment while comfortably reclining. When not receiving a treatment, you will help send energy to the person in the circle receiving the Reiki treatment. It is a great way to discover Reiki, or to enhance your Reiki training, and you will feel relaxed and de-stressed. NO prior Reiki experience is needed, and all are welcome. Come explore the relaxing & de-stressing qualities of Reiki and why leading medical institutions are offering Reiki as an alternative therapy! Saturday, April 27th, 1:15 PM – 5:45 PM – Was sold out – one spot now available; book now! Sunday, June 2nd, 1:30 PM – 6 PM – previous sessions sold out; book early! Come discover the relaxing energy of Reiki and why major medical institutions, including cancer hospitals, are now offering Reiki as an alternative therapy! Waiting list: A waiting list is available for any sold out workshop, class, or training session. Please send an email to moonfloweryoga@optimum.net with your contact information including your cell phone number, and we will get in touch with you should an opening arise. Thank you. Saturday, June 29th, 1:15 PM – 5:45 PM – only one spot open – book now as this sells out quickly! In this special 4 1/2-hour Level Two training session, you will delve deeper into the principles of Reiki and receive a Level Two certification. You will receive 2 additional attunements to increase your spiritual vibration. Discover the first 3 symbols of Reiki and learn how to incorporate these into your Reiki practice. Use of the Reiki symbols also increases your Reiki energy. One of the symbols you will learn is the distance symbol which allows you to send Reiki energy to people in need who are at a distance and not in the same room as you. You will have an opportunity to practice using the symbols during a Reiki session with another person from the training, and you will also receive a Reiki treatment. A very informative, 40-page, illustrated handbook will be provided to you to take home as a great reference tool so you can continue to practice and learn the information from this Reiki Two training session after you leave. There will be a break with delicious homemade snacks. Waiting list available: There is a wait list available for any sold-out workshop, event, or class. Send an email to moonfloweryoga@optimum.net with your contact info, including your cell phone number, and we will get in touch with you should an opening occur. Thank you. Feeling more comfortable using Reiki. Having an opportunity to ask questions. Reviewing the basics of Reiki so you are more at ease practicing Reiki. Understanding more fully some of the key principles of Reiki. Practicing giving a Reiki treatment to another person. Learning how to do a chair Reiki session. You will receive a great NEW, illustrated Reiki Level One handbook that Nancy has prepared to which you can refer after the training session. There will also be delicious, homemade, vegan food served. Special Introductory Price: $95 per person for this 3 1/2-hour training session which includes food and the informative, illustrated handbook. Carol with Reiki One graduate Karen F.
Congrats to Lynn & Richard on becoming Reiki 3 Master Practitioners! 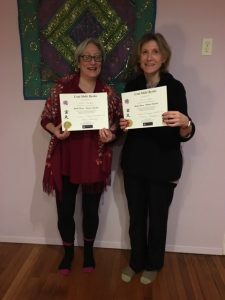 Carol and Sylvia become Reiki Master Teachers – November 2018! 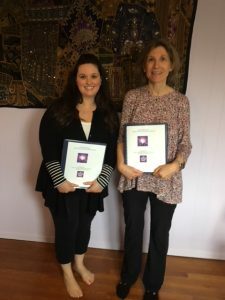 Carol and Sylvia successfully completed the 6-month Reiki training journey to become Reiki Master Teachers! Becoming a Reiki Master Teacher is a special calling, and takes dedication and hard work. After graduating from Reiki Level One, Two, and Three/Master Practitioner, those who embark on the path to become a Reiki Master Teacher do 6 months of intensive training and preparation to become a Reiki Master teacher. 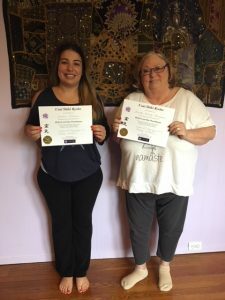 Carol and Sylvia did a great job, and we wish them well on this newest phase of their Reiki experience. Congratulations to both of you! Congratulations to the newest Reiki Master Practitioner, Deborah M, who completed her training with Nancy in July. 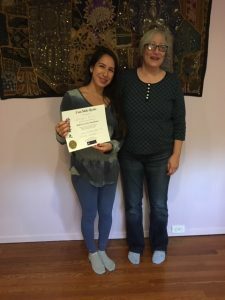 Deborah received the final attunements of Reiki, learned 3 new symbols, as well as advanced Reiki techniques to help her in her Reiki practice. She did great! Deborah was joined for the day by Carol P, who has already become a Reiki Master Practitioner and is studying to become a Reiki Master Teacher under Nancy’s tutelage. Good luck, Deborah, on your Reiki journey! 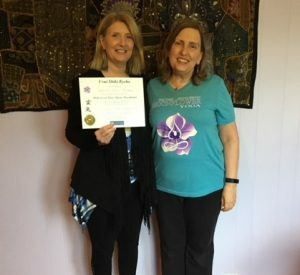 Joann and Linda successfully completed Reiki Level One training with Moonflower Yoga owner and Reiki Master Teacher, Nancy Weshkoff, in June, 2018. 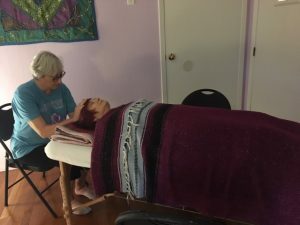 They learned the basic foundation of Reiki, and each had an opportunity to practice what they learned doing a Reiki session on each other under Nancy’s guidance. 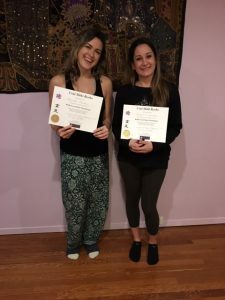 Congratulations to both of them, and we wish you well on your Reiki journey! If you’d like to become a Reiki Level One practitioner, scroll up to the next available Reiki Level One training date. Please book early as the training sessions are intentionally kept small to give you personal attention and sell out quickly. 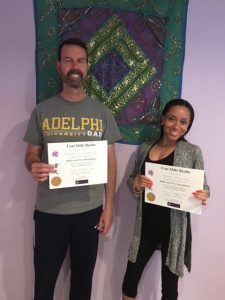 Richard and Tiffany successfully completed their Reiki 2 training in June. Both learned the first 3 symbols of Reiki, including the distance symbol, which enables them to send healing energy to those who are not in the same room as you. They did great, and congratulations to both of them! If you are trained in Reiki Level One and would like to proceed to Reiki Level Two, scroll up to see the next available training date. 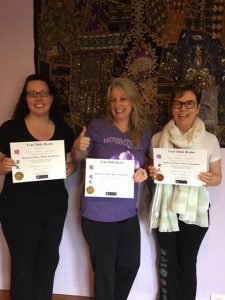 Three students proudly became Reiki Masters in May as they successfully completed the Reiki Master Practitioner level. Congratulations to Dana, Susan, and Mary! Each learned the remaining symbols of Reiki and received the final set of attunements. 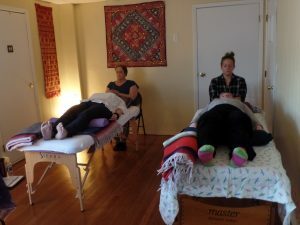 They had an opportunity to learn some new techniques which they can apply to their Reiki practice. They all did great, and we wish them well in their Reiki journey! 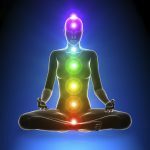 Moonflower Yoga is now offering Reiki refresher training for those who are attuned in Usui Reiki but feel they would like a brush-up on the Reiki principles and procedures. 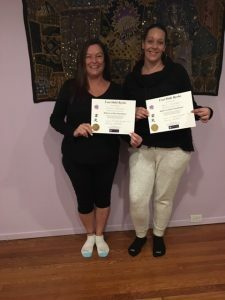 We had a very informative Reiki Level One refresher training session on May 6th with Sylvia and Jen who had an opportunity to review the basics of Reiki One and practice giving/receiving a Reiki treatment under Nancy’s guidance. They both also received a new, updated Reiki handbook. Stay tuned for the next Reiki Level One refresher training session which should be in the fall of 2018. 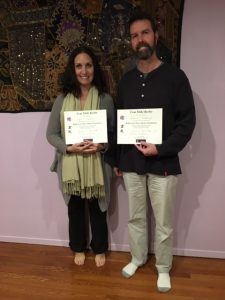 Congratulations to Laurie and Richard as they successfully completed Reiki Level One training with Moonflower Yoga owner and Reiki Master Teacher, Nancy Weshkoff, on April 14. 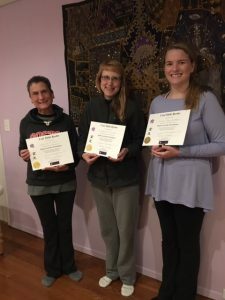 Nancy laid down the basic foundation of Reiki, and Laurie & Richard each had an opportunity to practice what they learned in Reiki sessions under Nancy’s tutelage. They both did great! If you’d like to become a Reiki Level One practitioner, scroll up to the next available Reiki Level One training date. 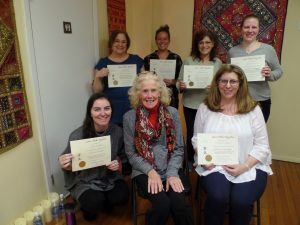 Deborah and Marjorie joined Moonflower Yoga owner and Reiki Master Teacher, Nancy Weshkoff, on March 18 for a Reiki Level Two training session. 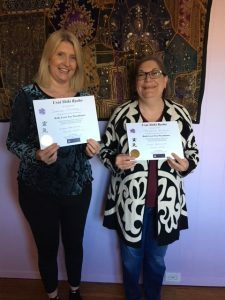 Deborah and Marjorie learned the first 3 symbols of Reiki, and Nancy further delved into the history of Reiki and additional ways to utilize their training. Both then had an opportunity to practice their newly-acquired knowledge on each other by doing a Reiki session. Congratulations to Deborah and Marjorie on a job well done! If you have been trained in Reiki Level One and would like to continue to Reiki Level Two, scroll up to see the next available Reiki Level Two training date. 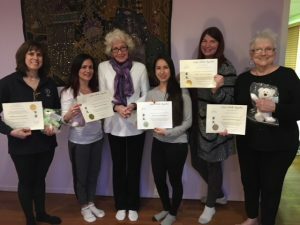 Reiki Level One training – February 2018: Congratulations to the Reiki Level One graduates in our February class: Marlene, Jennifer, Karina, Linda, Rose and Teri! All did g reat learning about Reiki, and it was a lovely afternoon. 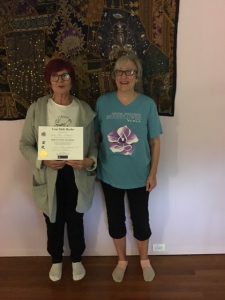 Connie and Nancy worked with the students, providing the attunements, and teaching them the basics of Reiki so that they can do Reiki on themselves as well as others. If you’d like to become trained in Reiki, scroll up to see the next available Reiki training date. 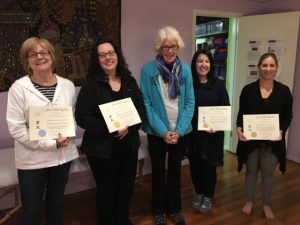 Reiki Level 2 training – January 2018: It was a lovely afternoon as 4 students took the next step in their Reiki journey and moved to the Reiki Level Two stage. The attendees learned the first 3 symbols of Reiki including the distance symbol and the power symbol. The students then paired up and practiced giving and receiving Reiki treatments. 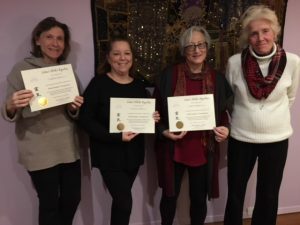 Congratulations to Pat, Lisa, Dana, and Jennifer on successfully reaching this next level of your Reiki journey! If you missed this Reiki Two session, scroll up for the date of our next available Reiki Two session. We had another fabulous Reiki Level One training session with Connie on July 9th, as Connie explained the basics of Reiki to the participants and then performed the Reiki attunements needed to enable the participants to become Reiki Level One practitioners. At the end of the training, the students were able to do basic Reiki on themselves as well as others. Many thanks to Connie and the participants for a great session! Did you miss this Reiki training session? Stay tuned – our next date will be held shortly. Scroll to the top of this page for additional info.